Double the rescue, double the joy - that was the case for two dogs named Oscar and Emmy, who the Chicago Police Department found in an abandoned building back in July. Oscar and Emmy were dangerously underweight and in need of emergency medical care, so the police called in a local rescue group, Trio Animal Foundation, to help. Emmy, the sweet red dog, was especially ill. "Her body was in starvation mode," Trio Animal Foundation posted on its Facebook page. "Emmy was started on IV fluids, pain medication, antibiotics and a slow feeding regimen." The dogs needed to be reintroduced to food slowly. They were so underfed that too much at once could have easily overwhelmed their systems. Emmy was scared and too weak to stand anymore. Things began to change right away for Emmy, especially since she met a very special human at the animal hospital where she was being treated. "Emmy fell for one of her vet technicians and he fell for her," Trio Animal Foundation posted on Facebook. "When Emmy was weak and didn't want to leave Anthony's side, he would drape her around his neck and carry her around like a little fawn ... this is when Emmy was happiest." Look who I saw at the vet today with her foster dad... Emmy! Anthony has taken care of Emmy since the day that she was hospitalized and he has never left her side since. Fingers crossed for a foster failure! Once Emmy was strong enough to walk around, she would go through the hospital searching for Anthony. The two were so close that Anthony teared up when it was finally time for Emmy to leave the hospital - and he couldn't say goodbye. Anthony officially became Emmy's forever dad at the end of August. "He couldn't lose his favorite girl," the rescue posted. Emmy with her new family! As for Oscar, he also made a full recovery. But he hasn't found his "Anthony" yet - he's still searching for a patient, loving home. He went through some special training to help him regain his trust of humans, and now he's all prepared to join a family. "After over two months of both medical and emotional rehabilitation ... Oscar is ready for adoption," the rescue posted. 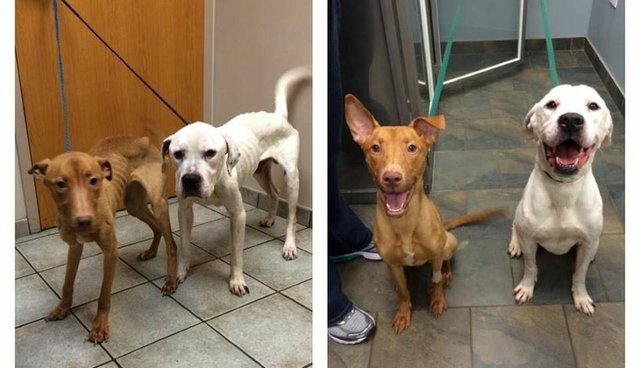 Considering where they started, and the condition they were in when they were first rescued, it's hard to believe these two dogs will both get the chance to be loved pets. But Emmy and Oscar prove that no matter what the past held, dogs are always ready to forgive, love and move on to a brighter, happier future. If you're ready to add a pet to your family, search for adoptable rescues on Adopt-a-Pet.com.